AlekoGates presents an innovative range of remotes for gate openers. These remotes give you comfort and satisfaction of sitting inside the car and automatically opening your gate and closing it. These remotes can even be fitted inside your car. 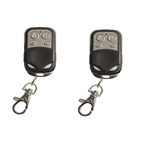 These are high frequency remote controls with 100% performance each time.